Hi! MikaelinhoFM here with the 22nd episode of my first ever FM18 blog “The Bromma Boys” about Swedish talent factory Brommapojkarna, and I must say that I’m still really loving both the save and this blog series, perhaps more than ever! If you missed last seasons’ updates, do go back and read them through the links below. This episode covers the entire 2026 season, the fifth and final season of our five year plan that we launched at the end of 2021. Since then we’ve won four straight Allsvenskan titles and slowly improved our performances in Europe. We managed to get through last year’s Champions League group stage and start off this season in the toughest possible way against Arsenal in the first knockout round. We made some significant sales money-wise, raking in a total of €23.5M. None of the players who left were of real importance to our first team. Club Icon John Guidetti, even though we signed him as a back-up, started complaining about lack of first team football so we had to let him go. We also got rid of Semedo, Högberg, Bassilekin and Madani, all former prospects who didn’t progress enough to remain in our long term plans. 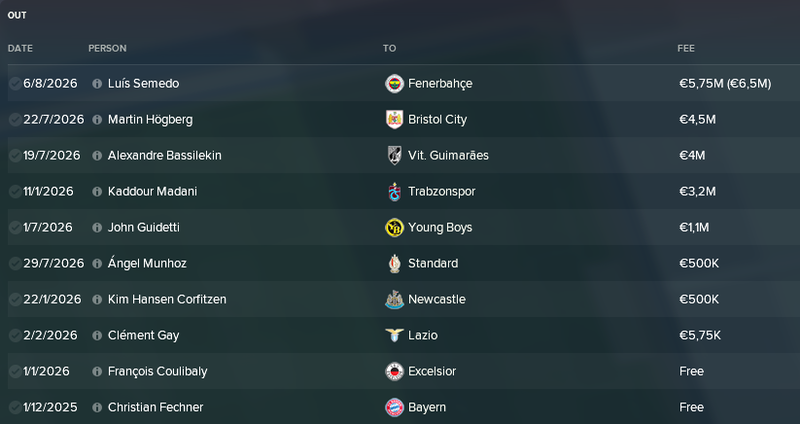 Regarding players in, we didn’t sign anyone for our first team, even though Brazilian wonderkid Vitor Farah might not be too far away from making first team appearances. We’ll get back to all these exciting signings in the coming Academy Report. We were piss poor in our first game after the pre-season friendlies, sadly this was our most important game ever. We weren’t even close as Arsenal easily beat us 4-1 at our home ground, which basically meant the end of our European adventure. Getting knocked out wasn’t my main concern though, as I had already counted on falling short to Arsenal. What worried me was how bad we looked! We seemed to have a terribly hard time linking play from the midfielders to our forwards. We kept losing the ball in the final third with constant counter attacks against us. This prompted a slight tweak to our original 4-4-2 tactic where I pretty much just dropped one forward into the advanced playmaker role. This worked wonders as we won the second leg away, actually being the better team over 90 minutes. However, Arsenal naturally went through to the second round on aggregates. Nothing much to talk about really. Business as usual as we earn an easy 1st place in our group after three proper smashings. I really can’t remember if we’ve ever lost a Swedish Cup group stage game!? Quite opposite to the group result we put up an underwhelming result in the quarter-final against IFK Göteborg. We were the better side when it came to possession and creating chances, but football games are won through scoring and scoring only. Göteborg scored three ending our Swedish Cup run prematurely. It’s the usual suspects in the top 4 of the media predictions. We are predicted to win our fifth consecutive title, and of course I won’t settle for anything less! Goteborg and Hammarby are the sides predicted to challenge us for the title. By looking at the results above you probably won’t have to look at the table below to figure out that we won our fifth consecutive title, which I’m absolutely thrilled about! We ended up winning the title by a hefty 28 point margin to Stockholm rivals Djurgården and AIK. The latter was the only team standing between us and an unbeaten season, winning 1-0 against us right before the summer break. 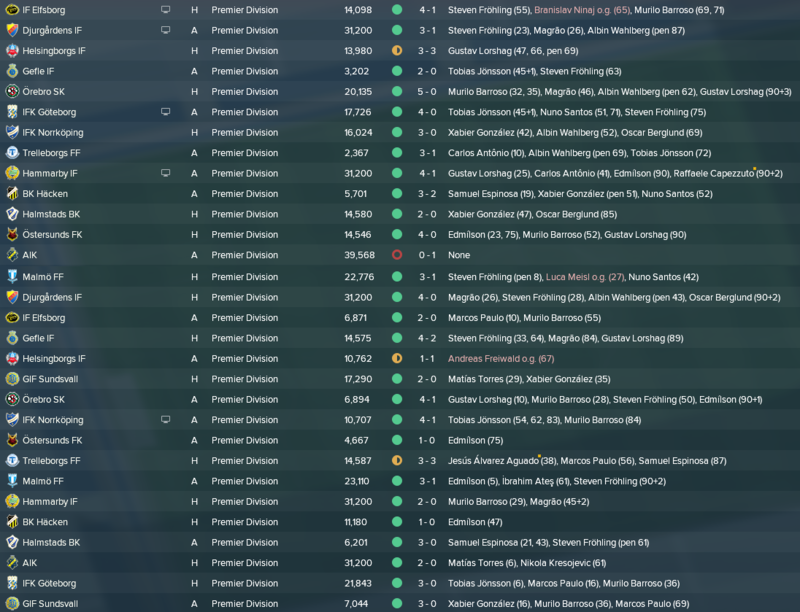 So, our fifth straight league win, making this one of the most successful Swedish eras ever! I’m really keen on building on this, adding more domestic titles to the list! In a tough group we really exceeded our wildest expectations, losing only to a fantastic PSG filled to the brim with talent. We won the rest of our games earning us a first place in our group and a place in next year’s knockout stage. We are really building on our success, slowly but steadily making us a European force to be reckoned with! Our finances are really solid now, but I will keep you in a bit of suspense as to how solid they are. You’ll just have to wait until we sum up this 5 year period in the coming bonus episode! I can tell you this much though, we have enough money in the bank to be able to continue expanding our stadium. When finished in 2027 we will have a nice capacity close to 20K, not bad at all! Brazilian star Magrão took the Fans’ Player of the Season Award back from Tobias Jönsson after a season-high average rating as well as the most assists. German youngster Steven Fröhling scored the most goals ahead of Gustav Lorshag, who managed to secure a spot in the Team of the Season anyway. A great season! We were outstanding both domestically as well as in the Champions League group stage. This is truly the beginning of a Dynasty! To take the next step however, I feel that we need to progress past the first knockout stage of the Champions League on a regular basis, being able to call ourselves one of Europe’s finest! I feel that perhaps we have relied on the Academy a bit too much, and perhaps we need to bring in some star quality from somewhere else!? In the next episode we will take an in-depth look at what’s been cooking in the Academy, aka the Talent Factory, during 2026. In 2025 the feeling was that our Academy players didn’t progress as we had hoped. Has a change in the training regime given the players a boost or is our Academy starting to fall behind? Read the next post to find out! Thanks for the read, I hope you liked it as much as I did writing it! Do head over to Twitter and follow Mikael. And if you enjoyed this post give it a like and feel free to share it. To make sure that you don’t miss any posts on this site and in this series, follow our blog to receive an email when we publish a post! Just add your email to the box as displayed either in the sidebar (pc or laptop) or below this post (mobile). This entry was posted in FM18 Stories, Football Manager 2018, The Bromma Boys | @MikaelinhoFM and tagged brommapojkarna, champions league, fm stories, fm18, football manager, sweden, swedish allsvenskan, swedish cup. Bookmark the permalink.